According to a recent New York Times report, two studies carried out in Europe have concluded that pesticides may be responsible for the alarming decline in the world population of honeybees and bumblebees. The results of these studies, one of which was carried out in France and the other in Britain, were recently reported in the journal Science. 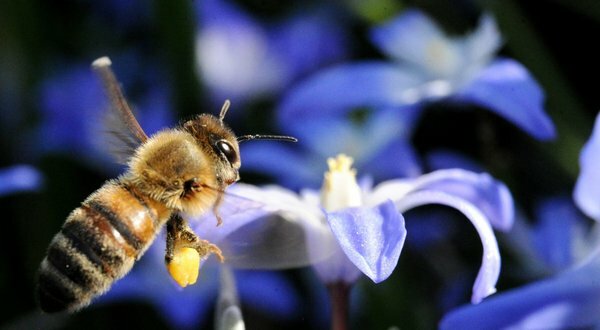 Both studies conclude that a common category of pesticides, known as neocotinoids, can have very harmful effects on bee populations that come in contact with them, even at very low levels. If you were able to see the film “The Vanishing of the Bees” which I discussed in an earlier post, these conclusions will sound familiar. Many of the scientists, experts and beekeepers interviewed in the film are convinced that these kinds of systemic pesticides are at the root of the declining bee populations. According to the film, the governments of France and Germany, among others, began taking steps to ban neocotinoids several years ago. The film sites the recovery of European bee populations after the implementation of these bans as further proof of the harm that neocotinoids can cause to beneficial insect populations. I am not a scientist, but if I understand correctly, neocotinoid pesticides are designed to be non-lethal at low doses. They are often applied to the seeds of crops to be protected, with the result that pesticide is then found in small amounts throughout the mature plant, including in its pollen, leaves, stems and flowers. As pests come into contact with the plant, they receive small doses of the pesticide. While not immediately lethal, these small dose exposures can cause permanent damage to the nervous and immune systems of pests. This is the mechanism by which the pesticide kills pests; as a side benefit (? ), the effects of these pesticides can even reach future generations of pests through DNA damage. The main question I have is this: if this works on pests, why would anyone expect it would not have the same effect on beneficial insects like bees. And why would it not have the same effect on other animals that eat the plant, like humans for example. But then, I am not a scientist. This entry was posted in Food in the News. Bookmark the permalink. I saw this in the NYT, too, thanks for putting it in the larger context. Another reason to choose organic. The Pollinator Pathway project you mention in another post looks like a great idea. I garden with lots of single flowers to provide nectar and pollen for insects, and appreciate getting lots of bee visitors. My HOA often questions my garden despite their previous approval, but the hassle is worth it to me to keep my ‘nonstandard’ landscape.